WHERE: The Eric Carle Museum of Picture Book Art, 125 West Bay Rd. Amherst, MA. In 1970, Eric Carle published The Tiny Seed, which chronicles the life cycle of a plant across the four seasons. It was the first of many stories he would illustrate about the wonders of nature at all times of year. 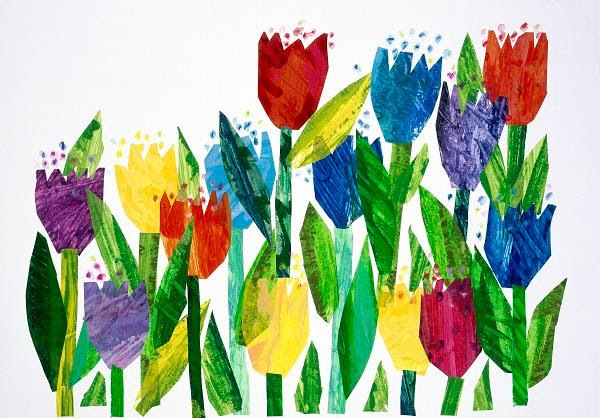 The Art of Eric Carle: Seasons celebrates five decades of Carle's seasonal imagery, from hibernating bears in winter and hatching chicks in spring to colorful flowers in summer and apple trees ripe for picking in fall. The exhibition, on view April 3 through August 26, 2018, features Carle's iconic collage art from 15 picture books as well as several never-before seen watercolors. It also includes a special display, Eric Loves Bobbie, of personal artwork Carle dedicated to his late wife throughout their 42-year marriage. 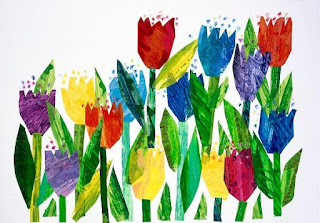 The Art of Eric Carle: Seasons features original art from Does a Kangaroo Have a Mother Too?, Draw Me a Star, Little Cloud, 10 Little Rubber Ducks, Animals, Animals, and I See a Song, among other titles. Carle's work for other authors, such as Norma B. Green's The Hole in the Dyke, Arnold Sundgaard's The Lamb and the Butterfly, and Alice McLerran's The Mountain that Loved a Bird are also on display. Linoleum prints, which Carle created in 1965 for the cookbook Red-Flannel Hash and Shoo-Fly Pie, are showcased. Also included are several never-before-seen watercolors and unpublished drawings and collages, all providing glimpses into Carle's working method and personal interests. There are several activities for guests to enjoy in the gallery. A custom-designed "book garden"--which grows both felted vegetables and real books!--encourages visitors to harvest a story. There are flip-and-find character surprises among the exhibition graphics (including the Very Hungry Caterpillar!). In keeping with the theme of seasons, guests can manipulate felted tree forms to mirror the season they love most. Love is a central theme in the mini-exhibition Eric Loves Bobbie. Carle often presented Bobbie with gifts of art to celebrate their anniversary or to mark other special occasions. He shares some of these pieces, including a Christmas portrait of their dog Tock and a sweet Valentine of a cat licking its paw. Chief curator Ellen Keiter says the idea for The Art of Eric Carle: Seasonsdeveloped while planning for Bobbie's Meadow, a two-year project that will debut in June and honor the Museum's late co-founder. The new outdoor space, in which visitors can experience every season of the year, inspired Keiter to think about the cycles of nature, growth, and renewal--all themes present in the exhibition. "Once I landed on the subject, it was fun to research Eric's artwork of the various animals, plants, and activities associated with the different seasons," says Keiter. "I was particularly excited to discover early floral watercolor paintings and a garden plan Eric sketched for his former home in nearby Hawley." Keiter adds, "I'm eagerly anticipating springtime and the exciting new exhibitions and programs it will bring." Join Eric Carle and Museum staff for a ribbon-cutting and grand opening of Bobbie's Meadow, a new outdoor space in the Museum's orchard. Visit www.carlemuseum.org for more information.